After a relatively slow start to the 2019 season, Paul McBeth somehow exceeded his already astronomical expectations in his win at the Waco Annual Charity Open. Highlighted by a second round 18-under par, McBeth’s performance begs a comparison with his performance at the Great Lakes Open (GLO) last year, where he also famously threw an 18-under round. Let’s start our analysis with scoring opportunity. 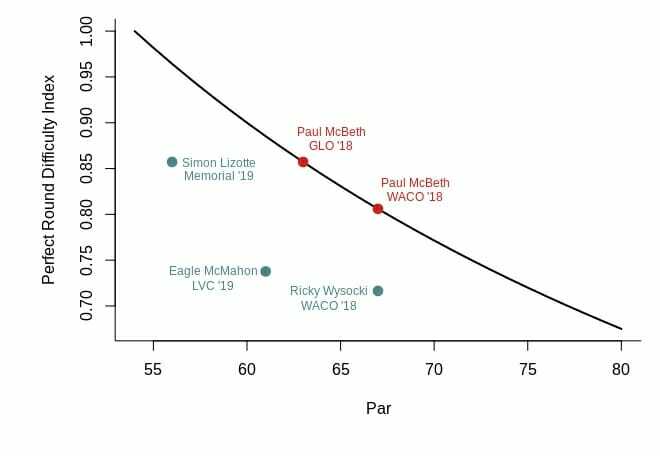 When I compared McBeth’s 18-under at the 2018 GLO to McMahon’s 16-under(s) at the Konopiste Open, I examined the opportunities available for the players to score at the respective courses. For the current comparison we are looking at Brazos Park East, which had a par 67 layout for WACO, and Toboggan, the course for GLO, which was par 63. In short, the higher par score for WACO means that McBeth had more opportunities to score. He had more opportunities for eagles on par 5s — to make up for missed birdies on par 3s — and to scramble after errant shots on par 4s to “save” birdies — it’s often easier to get a birdie after a bad drive on a par 4 than a par 3. In the McBeth-McMahon article, I formalized this scoring opportunity concept with a perfect round difficulty index, where a perfect index score of 1 would be the result of shooting 18-under on a par 54 course. As you can see in the plot below, McBeth’s score at GLO was a 0.86, whereas at WACO it was a 0.8. This corroborates the difference in par scores I mentioned above and indicates that McBeth’s GLO 18-under was more impressive than his WACO 18-under. Difficulty index versus par score. The black line represents the difficulty index for 18-under at each par score. The dots represent difficulty scores for specific rounds. I added a few other round scores to the plot for context. Ricky Wysocki’s second round 16-under at WACO had a score of 0.72, McMahon’s 15-under in the final round at the LVC had a score of 0.74, and Simon Lizotte’s 16-under in the first round of the memorial had a score of 0.86, which is the same as McBeth’s score at GLO! On one hand, I think Lizotte’s score points to a limitation of this index because even though the par score at Fountain Hills is only 56, I don’t think anyone would say it is a course that is hard to score on. On the other hand, Lizotte’s 16-under round rating was almost exactly the same as McBeth’s 18-under round rating at GLO,1 giving some credence to the similarity in their index scores. We will come back to round ratings later. Next up, let’s dive into the stats from UDisc Live. Obviously, all of McBeth’s stats for GLO and WACO are great. He killed it on the fairways and greens at both tournaments. Of the 3,872 non-WACO player events within the UDisc Live dataset, McBeth’s GLO performance is the 17th most similar one to his WACO performance. Seventeenth may not sound that impressive, but it is in the 99th percentile of compared events. Despite the similarities, there are some differences of note. At WACO, McBeth’s long distance accuracy score was 98.9 and his short distance accuracy was 89.2. Remember, these scores are out of 100, so McBeth’s are quite good! You can see where his performance falls on the plot, which includes all rounds from all tournaments with UDisc data. It is better than pretty much all of them. However, you can also see from the plot that his play at WACO was not quite as good as his play at GLO. His long and short distance accuracy scores at GLO were both 99.9! These results corroborate the scoring difficulty index results. 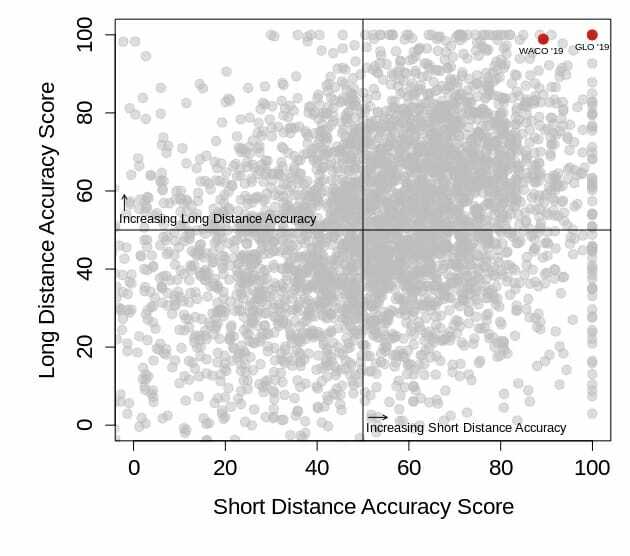 Scatterplot of long versus short distance accuracy scores for MPO players. 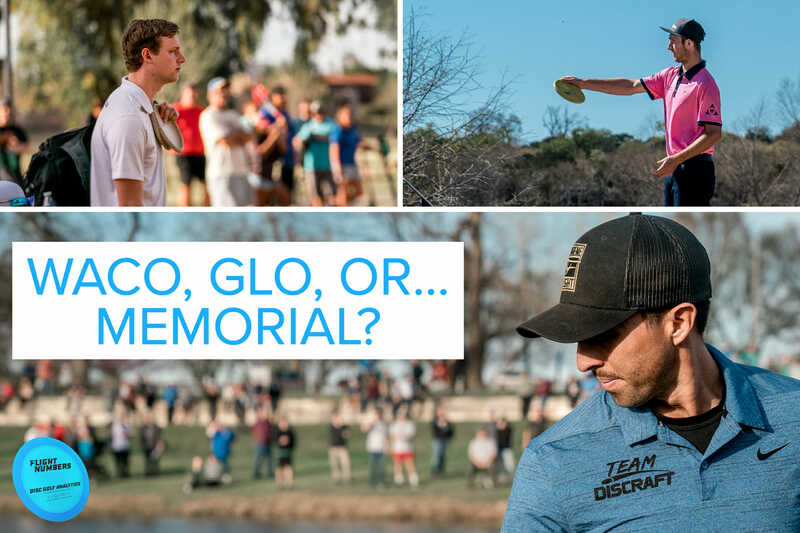 McBeth’s WACO 2019 and GLO 2018 scores are in red. Finally, I want to touch on the probability or likelihood of shooting an 18-under. 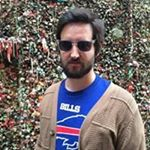 UDisc took a stab at it with a pretty cool simulation. You should read the article for details, but one limitation of their methodology is that they couldn’t use it to calculate the probability of McBeth himself shooting an 18-under. So, I took a shot at calculating it using a different method. Instead of a simulation, I used the magic of the normal distribution (bell-shaped curve). Player performance follows a normal distribution. In the context of round ratings, this means that, on average, a player’s round ratings equal their player rating. But they don’t always equal their player rating. At a predictably frequent rate, players shoot a little higher or lower than their ratings, and occasionally MUCH higher or lower than their ratings. We can use the predictability of this variation (as represented by the normal distribution) to calculate the probability of particular round ratings. Using this method,2 McBeth’s 18-under at WACO (player rating of 1051 and round rating of 1101) had a probability of 0.0083, which converts to a 1 in 120 chance. Whereas his 18-under at GLO (player rating of 1044 and round rating of 1108) had a probability of 0.00066, which translates to approximately a 1 in 1500 chance. McBeth performance (normal) distribution with lines representing his 18-under at WACO 2019 (blue) and 18-under at GLO 2018 (red). 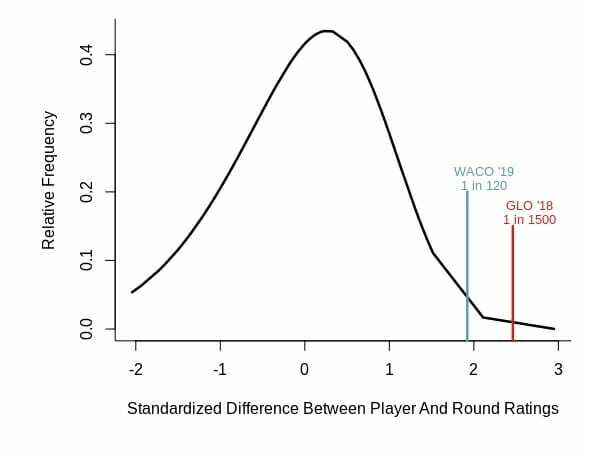 The difference between McBeth’s WACO rating and his player rating was about 1.92 standard deviations above expected and his GLO rating difference was 2.46 standard deviations above expected. These astronomical probabilities bring us full circle. Despite McBeth’s incredible rating and incredibly high expectations, he was still able to outstrip them at WACO. And what’s even more incredible is that despite his expectation shattering play at WACO, it wasn’t quite as spectacular as his play at GLO. Comments on "Flight Numbers: WACO Or GLO? That Is The Question"